In 2017, the owners of Tamzen’s Bridal at Butler Manor announced their idea of sponsoring an annual $500 scholarship. Robert and Tamzen Sonntag believe in investing in leaders, achievers, and education. They support commitment to encouraging the educational advancement and leadership development of young individuals in South-Central Pennsylvania. The Tamzen’s Bridal Scholarship fund is a postsecondary scholarship program that supports and promotes individuals who are committed to positively impacting the bridal, fashion and/or business industry. 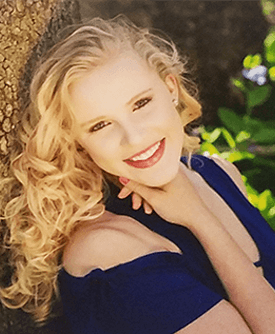 Kersten is a 2018 graduate of Big Spring High School. 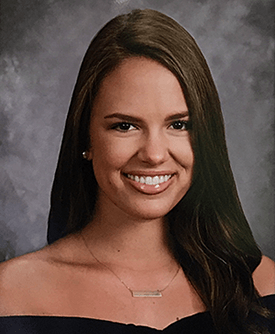 She is the daughter of Tobie and Heather Wolf of Newville, PA.
Kersten was a member of Big Spring High School’s Student Council and National Honors Society. Kersten played field hockey all four years of high school and was also a member of the track and field team her senior year. In the fall, Kersten will be attending James Madison University as an undeclared business major. She loves fashion, shopping, and watching “Say Yes to the Dress.” Kersten spends time with her friends and family. She enjoys being active and participating in outdoor activities such as biking, kayaking, camping, and hiking. Julia is a 2017 graduate of Cedar Cliff High School. She is the daughter of David and Janet Wazeter of Mechanicsburg, PA.
Julia was a member of Cedar Cliff High School’s National Honors Society, and the senior class corresponding secretary. Julia was also awarded the 2017 Mary Sach’s Memorial Scholarship. She earned varsity letters in track & field, basketball, and cross country. In the fall, Julia will be attending Thomas Jefferson University (formally known as Philadelphia University) majoring in Fashion Merchandising & Management. She is a member of Fashion Industries Association (FIA) and has participated in Philadelphia Fashion Week. Julia is also a strong supporter of Four Diamonds and works diligent at organizing fundraisers for this amazing organization.